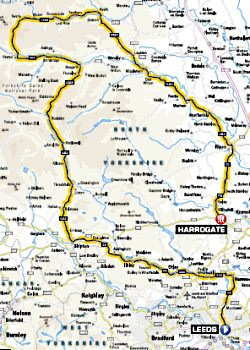 On Sunday 6 July 2014, Day 2 of the Tour de France will start here in York. This is astonishing and fantastic news. It means that, for once, bikes will have priority through the centre of town, unencumbered by vans delivering flatpack wardrobes to Argos, cars displaying disabled badges whose occupants miraculously walk unaided to Barnitts, and tourists stepping out backwards in front of you as they try to get the Minster frontage on their iPhone. 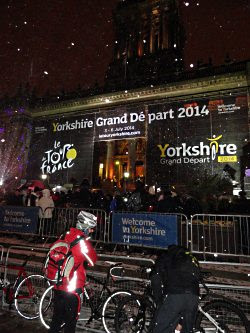 The press launch of Yorkshire's Grand Depart for 2014 - aye, grand indeed - was in Leeds Town Hall, last night (picture). We learned brief details of the route: that Day 1 (good for sprinters, picture) will go from Leeds to Harrogate, and Day 2 (good for attackers) from York to Sheffield. Perhaps wary of the links between drugs and past, now-forgotten, Tour winners, the launch involved no performance-enhancing chemicals. There wasn't a free glass of wine or canape to be had. Well, this is Yorkshire. If you want a drink and a snack, there's a Wetherspoon round the corner, you know. We're here to work. But it was still packed out, with standing room only (picture). 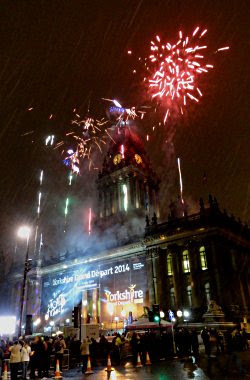 When Welcome to Yorkshire announced they were bidding for the Tour it was something of a joke. Now it's happened. To paraphrase Bob Monkhouse, when I told people I wanted to be a comic writer, everybody laughed. They're not laughing now. If you'd said to me 20 years ago that in future people will pick up dog poo in plastic bags, pubs will be smoke-free, and people will show you videos of their cat on a mobile phone, I'd have just about believed you. 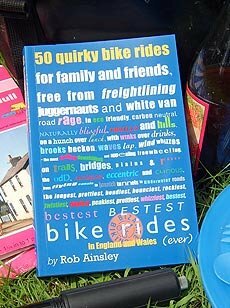 Even, maybe, that we'd have a British Tour de France winner. But the Tour de France itself going almost past my front door (picture)? No way. Indeed there won't be a way. It'll be too crowded, especially as all my friends and relatives are now angling to come and stay. Now, at least, we can enjoy the 2014 Tour in the same way as the French: stood in a bar, half-watching it on telly, complaining about the crowds, and moaning that today's cyclists are not a patch on the old guys. The launch party finished outside, in the swirling snow, with flaming-jugglers and fireworks (picture). Obviously I had to Facebook my snaps, and had to find a wifi opportunity. Luckily there was a Wetherspoon round the corner. 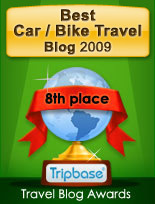 I've also blogged this morning about the Tour de France coming to York on the excellent York Mix website. I'm from Knaresborough so almost beside myself with excitement at having the tour spend two days essentially on my doorstep. We're all booked in to stay at my parents. We're busy planning where we might see it: perhaps in the Dales on day 1 (Harrogate finish will be too busy) and K'boro high street on day 2 (hopefully the spectacle will outdo the annual bed race).